Scan your Windows PC for malware and suspicious files! Comodo Cloud Scanner (CCS) is an easy and powerful system scanning tool for PC that quickly and accurately identifies malware, viruses, suspicious processes and other problems with your computer. 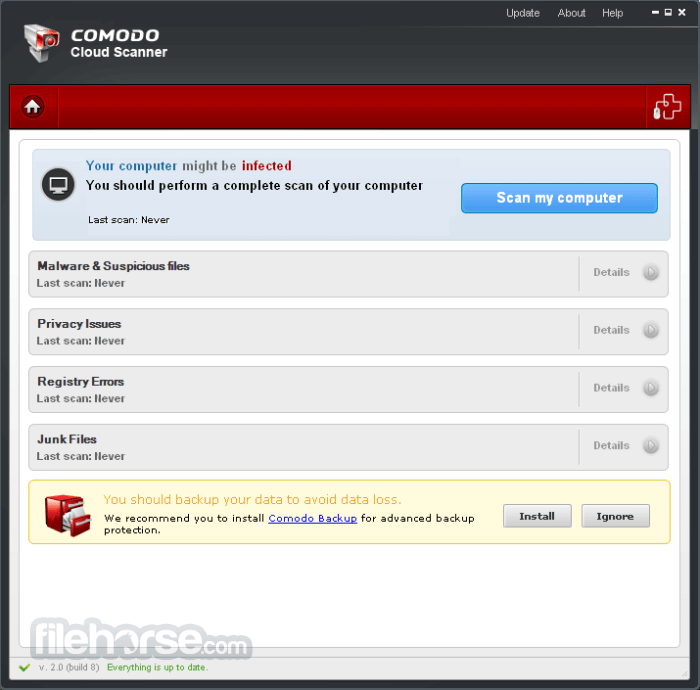 With Comodo Cloud Scanner, all virus scanning, processing and analysis of the files on your computer is done by software installed on our remote servers rather than by software installed on your computer. Because it makes a real-time connection to Comodo's online database, the software (CCS) detects the very latest malware, viruses and rootkits more accurately than regular anti virus software. You no longer have to wait to download signature updates to find out if your system is infected with zero-hour threats. Using cloud technology in this way makes scan results a lot more accurate as you are effectively checking your system against the very latest version of Comodo's database. It also takes the work load off your computer so there is much less impact on system resources and performance when running a scan. Comodo Cloud Scanner offers an extremely fast way of finding out whether your computer has viruses, root-kits, worms, spyware, adware, non-trusted processes or suspicious drivers and services. Apart from using a locally installed white-list of trusted executables, CCS also uses a real-time file look-up service to identify malware and suspicious (untrusted) files. The scanner is also great at discovering any hidden processes that are running on your computer – processes which may have been started by malicious software. Whenever you perform a task such as installing or removing a program or modifying a file on your computer, Windows creates an entry in the Windows Registry to reflect this change. Over time, these entries become disorganized and cluttered and slow down your computer. This is because, as the size of the registry grows, it takes longer and longer for Windows to sift through it to locate and update the entries for any new tasks you are carrying out. In short, your system becomes sluggish and slow. Cloud Scanner identifies Windows Registry problems by running an in-depth scan to find any unnecessary or corrupt keys. After cleaning the registry, Windows will be able to access the information it needs from the registry much more quickly - meaning your computer will get an immediate performance and stability boost. Over time your disk drives become cluttered with temporary Internet files, logs, needless archives, unused icons and duplicate files. These junk files take up valuable hard disk space and can have a negative impact on the performance of your computer. Examples include temporary files created by Windows, files retained in the Recycle bin, Windows log files, temporary Internet files, temporary files created by Office Suite and more besides. CCS will scour your system and identify all those files that you could happily live without. Windows and other popular software keep a record of your recent activities in the form of temp files, histories, cache files, cookies and usage records. This data represents a potential security threat because it might be accessed by hackers or other people that use your computer. For example, anybody with access to this information can know exactly what you were working on, which Internet sites you have visited and can read a full transcript of your instant messenger conversations. CCS helps to protect you from identity theft by comprehensively identifying all traces of personal data that may be lurking in Internet browsers, IM clients and many other applications.